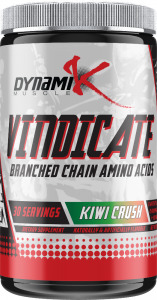 All the best Dynamik Muscle Vindicate deals in one place! Compare prices from all the top online stores to find the best price on Dynamik Muscle Vindicate. Fitness Deal News does the hard work for you of finding the best deals & coupons on everything fitness. By having an abundance of Branched Chain Amino Acids in the blood stream you are constantly feeding the muscle. From top pro bodybuilders to new trainees in the gym, we all get sore after a workout. But for how long is truly dependent on how we treat our body in the minutes, hours, and days following. You can greatly reduce the pain and soreness inside the muscle by supplementing with Vindicate. A saturation of BCAAâs and vitamins will significantly reduce delayed onset muscle soreness (DOMS)*.